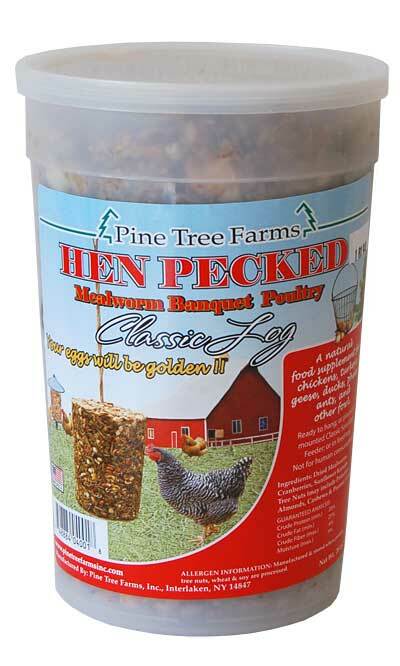 Supplement your poultry’s diet easily with these Pine Tree Farms Hen Pecked Mealworm Banquet Poultry Seed Logs. These 12, generous logs provide chickens, turkeys, or geese with a wealth of nutrients, helping them thrive. A gelatin binding keeps the mealworms, tree nuts, and fruit mixture nicely formed, and a twine loop on the top of each log makes them simple to hang. For more versatility, place a single log in your existing Pine Tree Farms Classic Seed Log Feeder (not included), or rest it on a poultry tray feeder for your chickens to enjoy. The high fat and protein content helps birds remain healthy, and often aids in egg development. Provide chickens and pheasants with fantastic nutritional supplements using these Hen Pecked Mealworm Banquet Poultry Seed Logs. Made in the USA. Note: This case pack includes 12 Pine Tree Farms Hen Pecked Mealworm Banquet Poultry Seed Logs, 1.75 lbs. each.